What is the why behind collective impact? Yes, by definition, collective impact is about multiple organizations collaboratively solving a complex social problem, but how does one identify a complex social solution? That’s where ‘emergence‘ comes in. The question is, why does so much of our built environment lack emergence… soul? 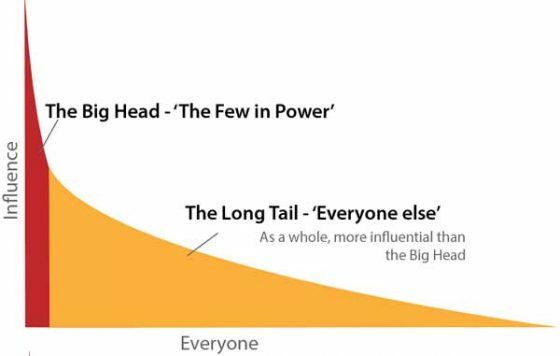 It’s because these communities aren’t being created as the sum of its parts, but rather by a few rather influential parts (‘big head’) that effectively decide what the sum is for all the other parts (‘long tail’). Thankfully, there is a system that communities and organizations can adopt that allows the long tail to foster emergence. It’s known as the Open Participatory Organization (OPO) developed by Bonnitta Roy. 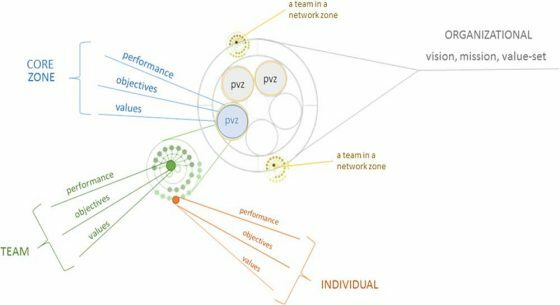 As you can see in the diagram of an OPO, the values of every individual is taken into consideration, allowing the emergence of teams, then zones, that make up the collective values of the organization. In other words, every individual’s values matter, but strategically organized as a collective force, as a cohesive long tail. What’s the benefit of this? Projects are primarily designed, governed, and where feasible owned by communities. Investments add more value than they extract. The financial relationship fairly balances risks and returns among all stakeholders. Thus, impact is what happens when the values of the people are fully taken into consideration. Emergence is the unscripted magic that happens when those people authentically express those values as a cohesive community, which is often best realized when they’re in the flow state. See the previous story for more on that. Stay tuned for Bonnitta Roy’s upcoming book on Open Participatory Organizations.